Spanning the Danube River in its Communist-era glory, New Bridge (Novy Most) connects the capital city's old quarter with the new town of Petrzalka. Stop to see the hulking 303 m (994 ft) long metal bridge and view its unorthodox design featuring an asymmetrical cable suspension attached to an 85 m (278 ft) tower. Note the tower's resemblance to a flying saucer, complete with a circular construction, glass windows, and a restaurant. Odds are you'll cross the bridge either entering or leaving the capital. On the way toward the old town, you can admire the view of the castle and historical buildings, and on the way out marvel at the vast sea of concrete residential buildings across the river. 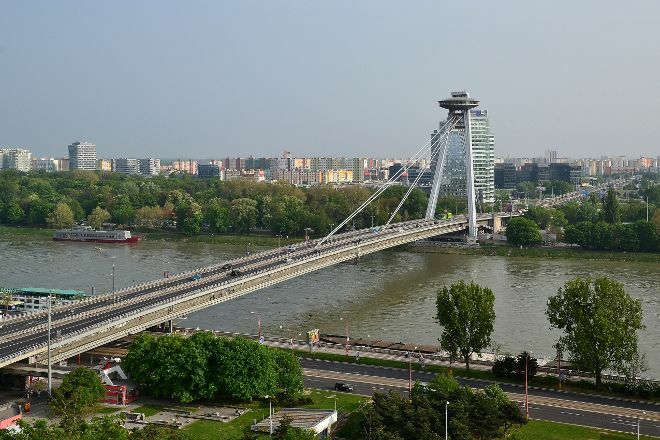 To visit New Bridge (Novy Most) and get the most from your holiday in Bratislava, create itinerary details personal to you using our Bratislava route site . Close to velkolepi bridge, with uzasnym at the Danube. Whether that can take a long time, but is it going to pesi pretty quickly. At night, it's nice to see the obzvlast, vysvietene area. Well, it would be delete graffiti on the bridge. Every day, we help thousands of travelers plan great vacations. Here are some tips on how to use your Listing Page to attract more travelers to your business - New Bridge (Novy Most). Promote your permanent link - https://www.inspirock.com/slovakia/bratislava/new-bridge-novy-most-a110500313 - on your website, your blog, and social media. When a traveler builds a plan from this page, the itinerary automatically includes New Bridge (Novy Most). This is a great way for travelers looking for a great vacation in your city or country to also experience New Bridge (Novy Most). Promoting your link also lets your audience know that you are featured on a rapidly growing travel site. In addition, the more this page is used, the more we will promote New Bridge (Novy Most) to other Inspirock users. For best results, use the customized Trip Planning Widget for New Bridge (Novy Most) on your website. It has all the advantages mentioned above, plus users to your site can conveniently access it directly on your site. Visitors to your site will appreciate you offering them help with planning their vacation. Setting this up takes just a few minutes - Click here for instructions.